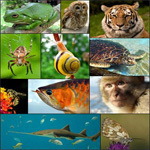 Animals are a major group of multicellular, eukaryotic organisms of the kingdom Animalia or Metazoa. Their body plan eventually becomes fixed as they develop, although some undergo a process of metamorphosis later on in their life. Most animals are motile, meaning they can move spontaneously and independently.